CAJON DEL MAIPO, Chile - These foothills in the shadow of high-country skiing in the Andes are a popular destination for outdoor enthusiasts, with trekking lodges, waterfalls and snowmelt runoff feeding the Maipo River and its white-water rapids. It is postcard images like this, of a nation blending with nature, that many Chileans would prefer their country be perceived, rather than one torn over energy resources. Indeed, an 8,600-acre nature reserve was created here after local residents waged a successful struggle to relocate a natural gas pipeline that was proposed for this area in 1997. With a climate that is often dry, sunny and breezy, large regions of finger-shaped Chile are ripe for development of renewable energy sources like solar and wind power. Chilean President Michelle Bachelet has set a goal of 15 percent of new energy generation by 2010 to come from non-conventional sources, including wind and solar. Although Chile's National Energy Commission and Chile's Economic Development Agency are funding more wind energy studies and projects, only 2.5 percent of the country's energy is currently derived from alternative sources. Meanwhile, the Chilean Renewable Energy Association believes that half the country's electrical needs could be derived from wind energy. In August it was reported that 23 wind energy parks around the nation are undergoing feasibility studies, in part due to the rising price of oil. Chile has very few proven crude oil reserves, and it obtains much of its natural gas from neighboring Argentina. In early December when the chairman of the Spanish electricity corporation Endesa visited, he inaugurated a wind farm his company developed in Canela, a city in northern Chile. The project is what's known as a Clean Development Mechanism, which is an initiative permitted under the 1997 Kyoto agreement that allows industrialized nations to invest in projects that reduce greenhouse emissions in developing nations. The Canela wind farm can generate 18.15 megawatts of electricity a year, small compared to the nation's current need for 12,000 megawatts. 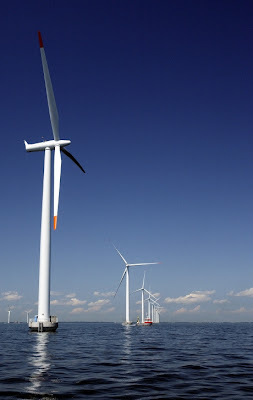 In Spain windmills generate 12,000 megawatts and in Germany windmills generate 20,000 megawatts of power.